Stoicism as a virtue is a rare element of Indian hockey teams. Burdened with the thought of over-playing or even hurrying through the process of building up to get that all-important goal, India, on Tuesday, showed calmness, restraint and a certain dispassion in dispatching off hosts Malaysia 4-2 in their 3rd match of the Sultan Azlan Shah Hockey Tournament. The victory was sweet, passionate and lent itself to the elements of youth so thoroughly embodied by Hardik Singh as central midfielder and Sumit Kumar as forward and winger. There were moments of the old classical hockey in the runs of Sumit Kumar. The other Sumit, who comes without a surname, did cause confusion among scorers and journalists alike but it was his display that showed the spine against Malaysia. In the defence, Birendra Lakra raised his level, thwarting attacks, moving the ball upfront and providing that tranquillity at the back, thanks to which the forwards played with abandon. India scored through Sumit (17th), Sumit Kumar (27th), Varun Kumar (36th) and Mandeep Singh (58th). The scorers for Malaysia were Razie Rahim (27th) and Firhan Ashari (57th). Malaysia has been a thorn in the Indian side. This was the 121st match between both the teams. India won its 84th victory with 20 drawn and 17 lost. Of those 17 lost, more than a handful have been in important matches, the last of which was the Asian Games semi-final. It would be childish to term these as revenge matches but the win would surely bring relief. Before the Asian Games match, India had lost another crucial game against Malaysia in the 2017 Hockey World League semi-final stage in London. 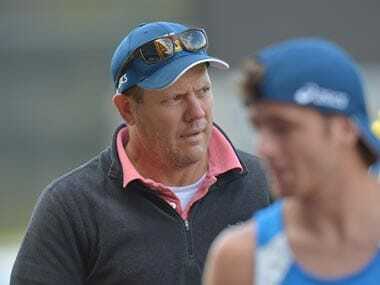 Those moments hurt Indian hockey and led to the resignation of Roelant Oltmans as chief coach. Both teams play a similar style with opening the flanks and exercising control in the midfield. Defensive formations are rarely seen when both match-up. India needed a victory after the 1-1 draw against Korea to keep its ambitions of playing the final. The start was tentative. Malaysia was the fluent team, switching its players with ease and keeping the Indian defence under pressure. The few Indian moves that came couldn’t be completed as the finish was erratic. Simranjeet Singh was causing trouble in the Malaysian striking circle as the first quarter ended on an even note. By the second quarter, Hardik gained control of the midfield. His below-par performances in the first two matches probably pushed him to stamp his class and he did it with authority. Taking charge, he slid the ball both ways, the left and right flank moving with fluency under Mandeep and Sumit Kumar. Two minutes into the 2nd quarter, Hardik from just outside the striking circle, slipped the ball in for Sumit who more with a reflex action deflected the ball that evaded Malaysian goalkeeper Hairi Rahman and slipped into goal. India led 1-0. Then came five consecutive PCs for India. Either an alert Hairi saved or the flicks lacked venom. By now the flow was both ways. Malaysia was hunting and at the same time didn’t want to bring on players from the defence. They were quite aware of the counter-attacking capability of the Indians. In that sense, their attack was slightly blunted. They too had three consecutive PCs and off the third Razie’s flick hit Sreejesh on the glove and went in. Malaysia had the equaliser and were back in the match. It was at this stage that Sumantri had Sreejesh at his mercy but he slipped while taking the shot. Luck was on India’s side. India reversed the tide as Hardik and Manpreet once again gained ascendancy. Off a move that started on the left flank, Manpreet slipped past two Malaysians, gave it to Mandeep whose tap found Sumit and the final pass was shot in by Sumit Kumar. More than the goal, the smoothness of the move rocked Malaysia. They realised India had control. Three PCs came in the 3rd quarter which took the total to 8 and off the last Varun Kumar finally scored as his flick went through the legs of Faiz Jali, standing on the goal-line. India was 3-1 ahead and promised more. Three PCs went Malaysia’s way with Pathak in the Indian goal saving a couple. India was without a referral at this stage having called for one earlier which turned out to be a wrong call. The forward line of Mandeep, Shilanand Lakra, Sumit Kumar, Simranjeet was running the Malaysian defence ragged. Even if the goals weren’t coming, Malaysia was pinned to their own half, striking circle, sometimes for minutes. In the midfield, Hardik reigned supreme. The 4th quarter saw the match open up. Since the 4 quarters were introduced, slowly it has been seen that in the 4th, teams usually start attacking. The ones with the lead defend, hoping to play out time. However, both Malaysia and India were more adventurous. The flow was of the game was unabetted. With three minutes 20 seconds left in the match, a Malaysian attack saw the ball loop up into the Indian striking circle. Firhan Ashari tried to hook it into the Indian goal. The ball, however, travelled sideways, deflected off Gurinder’s stick and went into goal. At 2-3, possibilities arose of an equaliser. There was enough time to pressure the Indian defence and even win a few PCs. Two minutes remained when the ball was sent to the right flank for Sumit Kumar. The youngster picked it up, twirled around the Malaysian player and set off on a run that would have made a sprinter proud. The Malaysians chased. Inches away from the touchline, Sumit Kumar cut the ball into the middle of the circle where Mandeep’s stick slashed at it to send it into the Malaysian goal. Malaysian shoulders dropped. They knew the match was beyond them as India held the ball for a minute to run down the clock. India have Canada and Poland to play and a full six points to achieve which would easily give them a place in the final. Eighteen circle entries against Malaysia showed a fearless, attacking talent. Fifteen shots on goal made them combative and aggressive. It is this zestful and vivacious display against Malaysia and hopefully deeper into the tournament that would make them such a joy to watch.